For the past couple of years Saturday has been just another working day for me. Working for yourself from home kind of means the days of the week are irrelevant anyway so I've never minded. Then for the past couple of weeks we've had birthing classes to go to which were a lot of fun but still an early start. But now I am officially on maternity leave ... no clients, no classes, nothing to do but get ready for this baby who will be here in 6 weeks (!!!) And what better way to celebrate a Saturday morning than with pancakes! I've been on an oats kick for the past month or so, having either porridge or bircher muesli every day without fail and although I wanted pancakes I wasn't ready to give up on my oats either. Lucky for me this recipe has been floating around for awhile, first at Joy the Baker, then at A Whisk and a Spoon. They were the perfect start to the day. We also finally got out to the movies for the first time in about 6 months and saw Ghost Town. We liked! 1. In a bowl mix oats and buttermilk. Let stand at least 15 minutes, or up to 30 minutes. 2. Meanwhile, in a small bowl, mix flour, sugar, baking powder, baking soda and salt. 3. In a large bowl, beat eggs, milk and vanilla. Stir in flour and oats mixture. Mix until evenly moistened, then fold in blueberries. 4. Place a nonstick griddle, or nonstick frying pan over medium heat. When hot, coat the pan with a few teaspoons of a light colored oil (you can eyeball the measurement). 5. Pour batter in 1/2 cup portions onto griddle and cook until pancakes are browned on the bottom and the edges begin to look dry, about 2 minutes. Turn with a spatula and cook another 1 1/2 to 2 minutes. Coat pan with more oil as needed to coat remaining pancakes. 6. Serve the pancakes as cook or keep warm on a baking sheet, in a single layer in a warm oven (less than 100 degrees Celsius or they will dry out) for 15 minutes, or until you’re able to serve them. 7. Stack and serve with berries, maple syrup, ice cream - whatever takes your fancy! This quantity will easily feed 4 people. We did find the batter a little runny. so next time I would use only 3/4 cup milk and double the baking powder to give them a little more lift. sounds like a good start to maternity leave! 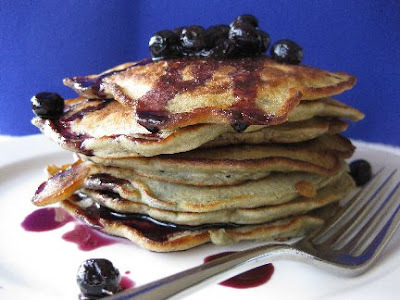 glad you liked them--the blueberry version looks tasty!